Thank goodness, or else my price (un)expectations theory suggests that worse price distortions in the future will be forthcoming. And hating the less than 7-day policy time frame between announcement and implementation. One of the main reasons why tariffs have gone up, is to erm...make sure we'd be more efficient in its use. But have we really done any better than say.... 1989? 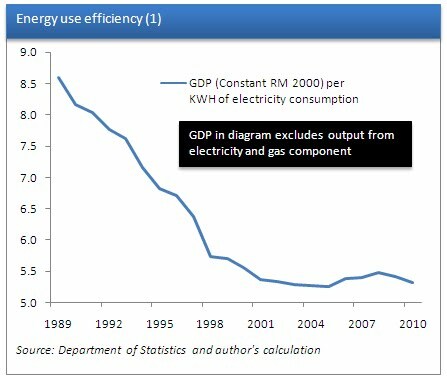 Apparently not... as a nation, we generate less GDP per KWH compared to 2 DECADES AGO (graph below)! How did no one see this coming? Quite frankly.... I have no idea why we are as inefficient with energy use for so long... I'm sure there's got to be a good reason. 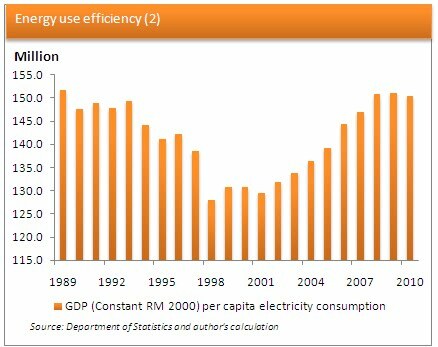 I mean we are no better than 1989 Malaysians when it comes to electricity savings!